Are you looking for an opportunity to start a business of your own, but worry about stepping into the unknown and not having enough work to keep you busy? Then a complete package from ChipsAway could be the answer. ChipsAway guarantee that all new franchisees will receive a minimum of £80,000 of prospective work enquiries in their first year*. Our market-leading franchise has been developed to make it as easy as possible for you to start your own business. You don’t need any experience, we’ll provide all the support you need to make your business a success. ChipsAway are the originators of the SMART (Small to Medium Area Repair Technology) repair process. As a full British Franchise Association (BFA) member with IMI, ISO 9001 and ISO 14001 accreditations and affiliation with 3M and BVRLA, you won’t find better quality training, products and ongoing sales and marketing support at any other franchise. We have been established in the UK for over twenty years. We now have the largest network of repair specialists in the UK, who have all undergone specialist training at our bespoke IMI accredited training centre in Worcestershire. As a ChipsAway business owner, you will visit customers locally in your mobile workshop, offering high quality, value-for-money, everyday car damage repairs, including paintwork scratches, bumper scuffs and minor dents – known in the industry as SMART repairs. With ChipsAway’s flexible business plan, some franchisees develop their business further and operate from a Car Care centre, with or without a mobile workshop, which can increase both the potential number of repairs that can be carried out, and the average repair value. SMART repairs are quicker, more convenient and better value than traditional body shop methods, and we pride ourselves on our five-star TrustPilot rating awarded to us by our customers for the excellent, high quality service we provide. A ChipsAway business package includes technical training, marketing and sales courses, ongoing business and technical support and advice, a host of marketing materials and a 24/7 Call Centre, based in the UK, ready to answer customer enquiries. This market-leading franchise will cost £29,995 +VAT, but with our various pricing options you will only need £15,000 +VAT to get started. Be your own boss with a turn-key ChipsAway franchise. A full member of the BFA, ChipsAway guarantee that all new franchisees will receive a minimum of £80,000 worth of customer enquiries* in their first year and are given all the support and training needed to start a successful paint and bodywork repair business. With ChipsAway, you will receive four weeks of expert, hands-on practical training at our bespoke facility – accredited with the Institute of the Motor Industry (IMI) – before starting work. But it’s not just the practical skills you need. We know that not all of you have previous experience running a business, so we also provide Business Mentoring from an experienced Franchisee, and dedicated Franchisee support team member to help you and a business plan template, which you can personalise to match your ambition. In 2017 the average ChipsAway franchisee received over £140,000 worth of customer enquiries via the ChipsAway head office. Beyond your initial training, we will make sure you have the network of support you need to run your business smoothly. With our ongoing technical advice, unlimited help and advice from your fellow franchisees and invitations to attend our annual Conference or Regional Meetings, our support is unrivalled. With around 250,000 customer enquiries coming in each year – that’s £40million of enquiries – from day one we will ensure you have enough jobs available to keep you busy. It’s up to you, and your ambition, how much work you want to undertake. Why go it alone when you can have the backing of a nationally recognised brand leader? ChipsAway are the UK’s leading minor automotive repair franchise with 1000% higher UK brand awareness than our nearest competitor, as confirmed by a recent YouGov survey. The ChipsAway Marketing Support team provides franchisees with extensive national advertising, including nationwide coverage on TV, and online and offline campaigns throughout the year to raise brand awareness. As a result of extensive national advertising campaigns, including our TV advertising, the average ChipsAway franchisee received over £140,000 worth of customer enquiries in 2017 via the ChipsAway head office. Our flexible business model can be tailored to suit your ambitions. Running a ChipsAway business means you decide how long you work, and how much work you undertake. As a ‘man in a van’ operation, some of our franchisees turnover in excess of £75,000 a year. If you’re interested in growing your business by taking on more staff or even expanding into multiple territories, we’ll be with you every step of the way. We support, so that you can succeed. This market-leading franchise will cost £29,995+VAT, but with our various pricing options you will only need £15,000+VAT to get started. Click the orange button to find out more detail about what it’s like to run a ChipsAway franchise. You can chat to some of our current franchisees and see a hands-on demonstration of the SMART repairs you could be doing. Interested in joining the ChipsAway franchise? Find out what current franchisees have to say about the business by watching this short video! Success story continues for ChipsAway award winners! Geography graduate Stuart Yorston little suspected that straight out of university he would be running his own highly successful business…. WOMEN IN FRANCHISING – Michelle motors ahead with ChipsAway! CHANGING CAREERS – ChipsAway franchisee Ryan is motoring ahead! BOUNCING BACK FROM REDUNDANCY – Ian is driving forward with ChipsAway! ChipsAway employee Callum Green Wins Silver at National Finals! 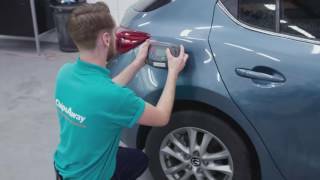 ChipsAway car repairers show off their favourite jobs ChipsAway is the UK’s leading network of minor car body repair specialists…. Are Female Drivers Getting a Raw Deal at The Garage? Record Consumer Leads for ChipsAway in August 2016! National push as ChipsAway resumes TV advertising! ChipsAway chalks up twenty year milestone! ChipsAway’s longest ever running TV campaign already drives record demand! ChipsAway are back on TV for their longest run ever! The UK’s leading automotive paintwork repair specialist ChipsAway is a victim of its own success, says Chief Executive Lloyd Evans…. Clive celebrates 10 years with ChipsAway! Fabulous new face of ChipsAway unveiled! Be your own boss with a turn-key ChipsAway franchise. 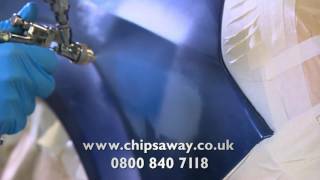 ChipsAway guarantee that all new franchisees will receive a minimum of £80,000 worth of customer enquiries* in their first year and are given all the support and training needed to start a successful paint and bodywork repair business. In 1992, after a successful sales career overseas, Jim got into the executive search business by purchasing an MRI franchise.... Read More.